Five items to consider when choosing a straight line action clamp. Some of our customers have settled on the types of clamps they like to work with and have stocked a few for ready use. If you are pushing on something, too much pressure can cause a problem. If you are holding something big and heavy, too little pressure can cause a problem. If you don’t know, ask an expert, that’s what I do. If you are using the straight action clamp for locating a hole, pressure isn’t as much of a consideration. The video is almost 10 minutes long this time, so grab yourself a beverage, sit back, relax, and watch. After I recorded the video, I learned that I was pronouncing “Te-co” wrong . It’s pronounced “TEE-k0”. So there you have it. There is a lot more that we need to address in the assembly of a straight line action clamp. But just in choosing a clamp, what else do you need to know? Please add your knowledge or questions to the comment area below the blog. That way we can learn from each other. I don’t profess to have all the answers, or even all the questions! So let’s learn together. If you haven’t already, sign up for the news and updates in the upper right side of the web page. All you need is your name and email. Then I can let you know when the next Weld Fixture Design 101 post is out. I am so excited! 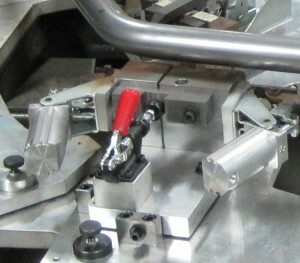 They talked about our Weld Fixture Design blog on Machine Design! The Weld Fixture 101 blog is also mentioned in the Milwaukee Journal ! Here is an interesting video on Bessey clamps.